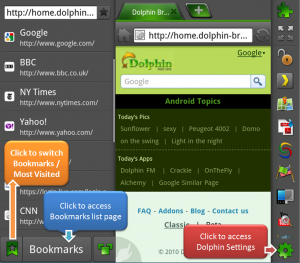 After what may have seemed like an eternity for users sold on Dolphin Browser enough to stick with the browser through a buggy version 3.0, Dolphin Browser HD 4.0 has just reached the Android Market bringing fixes and enhancements out the wazoo. OK, maybe they aren’t literally dripping out of the wazoo, but some pretty big fixes are included in the update, like the anxious side bar that seemed to jump out with almost no prompting, the inability to click links at the top of a page, and the addition of multi-language support and a bookmarks folder. Grab it in the market now!